There’s something truly strange about combat between Canadians and Americans. Long after they stop fighting each other, they continue to argue about who really won. This is true of both major battles (both sides believe that they won the War of 1812) and relatively minor rivalries (many Americans tried to argue that Canada didn’t win the 2010 men’s hockey gold in the Olympics definitively enough). It’s also true in the case of the infamous boxing match between literary heavyweights Ernest Hemingway and Morley Callaghan. Hemingway went to his grave disputing the results and trying to arrange a rematch. Callaghan shared his own version of events a couple of years later in his 1963 memoir That Summer In Paris. Hemingway and Callaghan became friends—and fans of each other’s work —when they worked together at the Toronto Star in 1923. “They had much in common: both were serious about writing, both yearned to become novelists, and they had similar literary tastes,” the Toronto Star’s Bill Schiller wrote in the 2012 feature The Curious Case of the Stolen Hemingway Letters. When Hemingway left for Paris in 1924, he invited Callaghan to visit him there. Callaghan and his wife Loretto finally took him up on his offer in the summer of 1929 and the two men rekindled their friendship immediately. It was during those early days in Paris that Hemingway first brought up the sweet science. 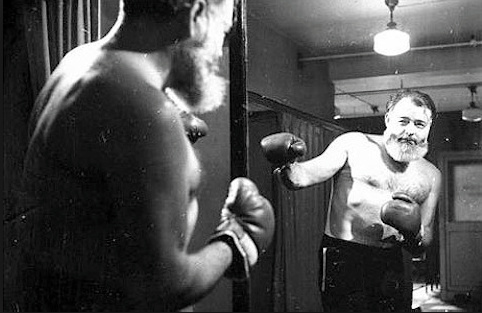 During a visit to Hemingway’s house, Papa asked the younger Canadian, seemingly out of nowhere, if he’d ever boxed. Callaghan said that he had. Hemingway produced a pair of gloves and demanded proof, right in his living room. Callaghan was quite baffled by the comment—and quite concerned about what would happen to his friend’s furniture if they came to blows—until he recalled a comment that Hemingway had made to a friend about a story pugilism-themed story that Callaghan had published recently in Scribner’s Magazine. Callaghan initially refused to put the gloves on, but his friend insisted. Callaghan put the gloves on and the pair sparred in front of their wives. Callaghan ducked a jab and blocked a cross. 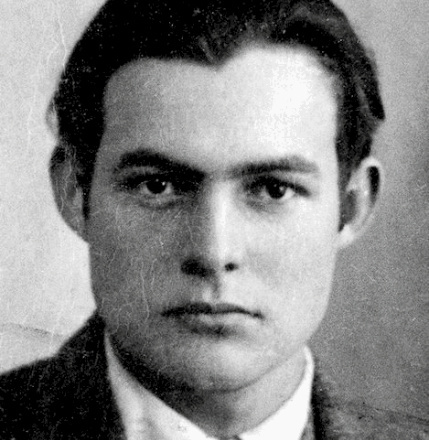 They traded a few more blows that were, in the younger writer’s words “ridiculous,” and then Hemingway was satisfied. “I only wanted to see if you had done any boxing,” he told Callaghan. “I can see you have.” Then he invited his friend to train with him at the American Club. It had no ring, but he promised that it had enough space for sparring. The two men met up the next day and headed over to the American Club and began to box a little more seriously. Callaghan was intimidated at first. With this insight, and more confidence in his own background, Callaghan started fighting back. Callaghan finished that session by confirming that Hemingway could take almost as well as he gave in his sparring. “That day he took a punch on the nose like any good college boxer; he took it with grace and an appreciation of the aptitude of the man who had landed it,” he noted in his memoir. 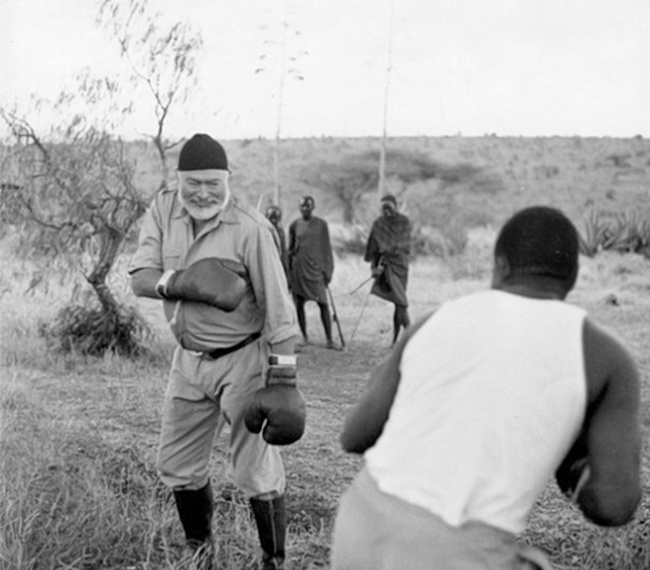 The pair began training regularly after that, and Callaghan began to read Hemingway’s psychological connection to boxing as well as his actual fighting style. Papa, he came to see, needed to believe in his own mythology. His vision of himself as a great boxer had somehow become integral to his art. Callaghan had no such illusions about himself, nor did he particularly understand why his friend needed this belief. But he admired the man, and enjoyed both his company and sportsmanship, so they kept training together. Callaghan was equally aware of his weaknesses against his friend, though. Their sparring continued quite amiably over the summer, although there was a minor issue when Hemingway got a split lip and responded by spitting blood all over Callaghan. This sentiment was put to the test when their mutual friend, F. Scott Fitzgerald, joined them in Paris. Fitzgerald and Hemingway’s friendship was becoming strained at that point—Hemingway wasn’t a fan of Scott’s wife, Zelda—but Callaghan was managing his separate friendships with both men quite well until Fitzgerald brought up boxing, speaking about Hemingway’s prowess with a sense of unquestioned awe. Fitzgerald asked if he could join them. The most infamous boxing match in literary history was set. When the three men arrived at the American Club, Hemingway handed Fitzgerald a watch and told him how to keep time: three minute rounds with one minute of rest in between. Fitzgerald seemed to be eager about his task, and things began on an entirely friendly note. Fitzgerald called time and the three men joked around until it was time to fight again. Callaghan noticed that other people at the club were starting to watch, and noticed that Fitzgerald seemed to be in awe. It was then that Fitzgerald realized that he’d let the round go an extra minute. The men continued to box after he returned, and Fitzgerald continued to plead his innocence, but the fun was over. The rest of the session devolved into a series of minor humiliations for Hemingway, and he never really forgave either man for it. His friendship with Fitzgerald essentially ended that day. His relationship with Callaghan was irreparably strained. When a gossip paper back in New York got ahold of the story, Hemingway blamed Callaghan for running to the press. All three became embroiled in a snippy letter war of sorts. Callaghan insisted he’d done nothing of the sort, and even wrote to the paper asking for a retraction. Hemingway wrote Callaghan two more letters after that. In one, he demanded a rematch. Hemingway also wrote to his agent Max Perkins in an effort to set the record straight. “I had a date to box with him at 5 p.m.—lunched with Scott and John Bishop at Pruniers—ate Homard thermidor—all sorts of stuff—drank several bottles of white burgundy. Knew I would be asleep by five... I couldn’t see him hardly—had a couple of whiskey’s en route...” He went on to insist that Fitzgerald had actually let the round go on for eight minutes. By 1951, Hemingway was telling Fitzgerald’s biographer, Arthur Miziner, that he has actually been swilling sancerre that day, and that the round had gone on for 13 minutes. Callaghan kept his own account to himself until Hemingway’s suicide in 1961. He refused to share Papa’s letters about the fight with the public as long as Hemingway’s widow was still alive. Those letters were stolen in 1993. They’ve yet to be recovered.